It was announced today that the Milwaukee Brewers have signed starting catcher Jonathan Lucroy to a multi-year contract extension. Lucroy agreed to a five-year deal (with a club option for 2017) which buys out all of what are probably four years of arbitration eligibility. The arbitration system normally only gives you three years of mediated contract decisions (if necessary), but a status called “Super 2” most likely would have applied to Lucroy after this year which gives an additional year of arbitration. The contract value is actually variable on whether Lucroy reaches that Super 2 status but reports say that the least amount Lucroy will earn over it is $11 million total. Non Super 2: $500,000 signing bonus, $500,000 salary in 2012, $750,000 in ’13, $2 million in ’14, $3 million in ’15, $4 million in ’16 and a $5.25 million club option for 2017 with a $250,l000 buyout. Super 2: $500,000 signing bonus, $500,000 salary in 2012, $1.9 million in ’13, $2.3 million in ’14, $3.3 million in ’15, $4.25 million in ’16 and a $5.25 million club option with a $250,000 buyout. It is rare to leapfrog any steps in the developmental ladder that is the minor leagues, but especially so when you’re a catcher. Lucroy did exactly that, however, in 2010 when the team needed another catcher following a season-ending injury to veteran Gregg Zaun. Lucroy joined the team from Double-A Huntsville initially as a backup to George Kottaras who now currently backs up Lucroy. The Brewers starter hasn’t looked back since. This is a move that makes sense on both sides of the ledger. 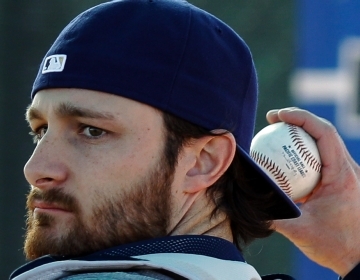 Lucroy, 25, gets that increasingly important guaranteed money. The Brewers gain some cost certainty with an eye on the future budgetary concerns of the ball club. Lucroy’s ability to handle the pitching staff, keep a running game relatively in check, and contribute at the plate enough are all lauded aspects of his game. Numerous pitchers were quoted last year as saying something to the effect of that Lucroy is still learning but he’s getting very good at his job behind the dish. Public praise from veteran pitchers to a young catcher isn’t exactly easy to come by. This projects to be Lucroy’s first season as the Brewers catcher on Opening Day. Lucroy was listed atop the depth chart in 2011 as well but missed Opening Day (and a few more days following) due to a broken pinkie suffered during Spring Training. Back in the saddle this spring, however, gives the starting pitchers a sense of security in the knowledge of who they’ll be throwing to the for the majority of their starts. With this extension in place now, those good feelings will continue…on both sides. Jonathan Lucroy is represented by Sports One Athlete Management. Welcome back to the countdown! We’re a dozen days away from the sights, sounds, and smells of baseball overtaking the sprawling Miller Park grounds. What a day it shall be! Unfortunately for today’s profile, Miller Park will likely not include him in its Opening Day festivities and therefore this preview won’t be as long as it otherwise would. Despite being a member of the 40-man roster, he is currently listed as third on the catching depth chart and is therefore slated for a minor-league optioning to be the starting catcher with the Triple-A Nashville Sounds. A champion this winter in the Puerto Rican League as a part of Los Indios de Mayaguez, Martin Maldonado is a 6’1″, 225 pound backstop who hails from Naguabo, Puerto Rico. Every player (well, in the National League at least) plays both offense and defense in a baseball game. For a catcher, however, defense becomes much more intense of a discipline. You’re involved in almost every single play and aware of everything happening on the field. The catcher is the only player in the game who sees everything happening on the field in front of him. Some catchers are offensive-minded and only catch a game well-enough to get by. Some catchers are phenomenal receivers, and have a great “catch and throw” but can’t hit their way out of a paper bag. Then every so often you get a catcher that seems like he’s going to be able to do both. Maldonado profiles as such a catcher. 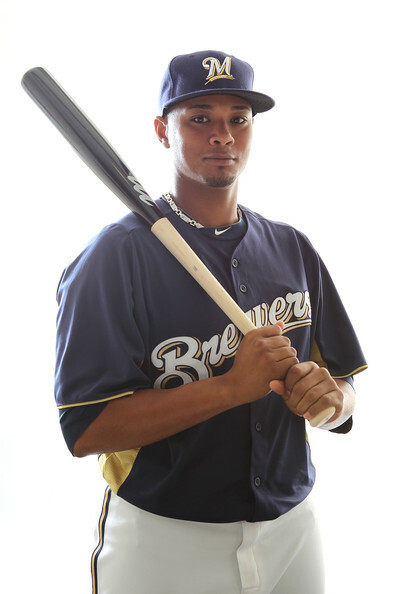 Already deemed ready defensively by scouts and those who follow prospects much more closely than I do, Maldonado had a bit of an offensive breakthrough in 2011 in the minor leagues while catching for Nashville following a promotion from Double-A Huntsville. 103 games, 342 at-bats, 47 runs, 98 hits, 18 doubles, 11 home runs, 59 RBI, 35 walks, 77 strikeouts resulting in a slash-line of .287/.373/.436 as a minor leaguer. He was rewarded with a promotion to the Major Leagues as a September call-up. His final season line was all buoyed by his Nashville-only numbers which saw him finish with a .321/.410/.537 slash line. His Spring Training this year hasn’t been tremendous, but it’s only 23 at-bats worth so I’m not worried in slightest. The writing has been on the wall for Maldonado’s ticket for the minors this year since incumbent backup George Kottaras agreed to a one-year deal back in early December. Kottaras was a non-tender candidate (much like Casey McGehee who ended up getting traded when a one-year deal wasn’t reached) in large part because the front office knew that they had another catcher waiting in the wings who they were comfortable going with if Kottaras wouldn’t agree. With another year of seasoning down on the farm for Maldonado on deck, it would not be a surprise at all if Kottaras was sent on his way before the next non-tender deadline this coming December. Normally you don’t like to simply give up a commodity like catching without getting something in return, but Brewer Nation can rest easy if Maldonado is the reason that it happens in this case. Remember those types of catchers we talked about before? Jonathan Lucroy leaned offense in the minors and has done an admirable job on his defensive skills since his unlikely promotion from Double-A to the majors after Gregg Zaun was lost for the season a couple of years back. Kottaras is most definitely an offensive asset but is also a defensive liability. Yes he pairs up nicely with Randy Wolf, but that’s not enough of a reason to keep someone around when his replacement would do it even better. Martin Maldonado is enough of an asset on both sides of the game that he might force his way into the lineup sooner rather than later. Then again, this is Randy Wolf’s last guaranteed season in Milwaukee anyway, isn’t it.